Children of narcissists often experience extremes in the behaviour of the narcissist both towards themselves and others. In fact there is often confusion over the diagnosis of bi-polar and narcissism due to the manic behaviours associated with both (Federman 2013). These extremes can be experienced by the same child within the same hour, leaving children of narcissists extremely confused and insecurely attached (which we will look at later). Children often find that they are either the Golden Child or the Scapegoat. So let’s look in more detail about what these terms mean. On the surface the child appears to be able to do no wrong. They are the perfect child of the perfect parent (the narcissists twisted view of their reality). They parade them around like a trophy. Initially this may sound like positive parenting, being supportive and encouraging, but when you look a little deeper, you start to see the unrealistic and unhealthy parenting traits. The narcissist will push the child to be the best. They will coach them tirelessly. Whatever skill the child has will be utilised to the extreme. If they are academic, they may push them to read endless books, one after the other, until the child cries for a break and even then it will be “don’t you want to be the best?”. If they are athletic, they will be up at the crack of dawn doing a punishing training schedule. Again, whilst you may be reading this and thinking “that’s how champion’s are made” let’s look at the impact on the child in this situation. The child may enjoy reading or running but they may also enjoy sitting eating pizza with their friends. But the narcissist won’t allow that. The narcissist is focused on ensuring the child becomes the best. Because to them, that will mean that THEY are the best. Narcissistic parents can see their children as extensions of themselves. When their child gets praise, they believe it is them who is being shown adoration. Every success is THEIR success. And the narcissistic parent is desperate for people to see how clever/beautiful/skillful/powerful and ultimately BETTER they are. And their children are the fast track to that. So the child is placed on the pedestal (with the narcissist parent closely by their side) for all to worship. But what about the child who isn’t naturally gifted? How do they fit in? This child is the epitome of all that is wrong within the narcissist. The narcissistic parent will seemingly hate this child because they also see them as an extension of themselves. But the parts the narcissist doesn’t want anyone else to see. The child can do no right. Everything is their fault. Think Cinderella’s evil step mom but on steroids! To the narcissistic parent, the scapegoat is their true self. The parts of themselves they detest. When they look at this child it is like looking in the mirror. They see all their own failings in this child and can’t help but point them all out. When they criticise the scapegoat, they are in fact criticising themselves. I think it is important to point out at this point that gender is not an issue here. Golden child or scapegoat can be either son or daughter. Extensions of self are not about physical appearance (although any compliments paid to the child – “he/she is really cute”- will be absorbed by the narcissist). They are extensions of their soul, their inner self, their subconscious. Also, a child can be BOTH golden child and scapegoat and often within the same day. One minute they can be on the pedestal, the next they are languishing in the pit of despair as they have caused narcissistic injury to their parent (although they may not know why). The narcissistic parent has a very fragile sense of self, fleeting between self love and self hate with great intensity. And the more stressed the parent, the more intense, extreme and regular those fluctuations occur. This can be very confusing for a child who is never quite sure whether they are loved or loathed. Our attachment style is a direct indication of how we were parented and so this element in the narcissist’s psychology is two fold when they become parents. Firstly, they are usually unable to form secure attachments to their children because of their own internal battle between love and hate. A child, who they co-created and is therefore part of them, represents the physical embodiment of all the parents’ hopes and fears (this is normal and natural). To a narcissist, they see themselves in this little person and often feel terrified. Terrified that they will turn out just like them. So they may pull away. Leaving the child feeling rejected and unsafe with the narcissistic parent who in turn will pull away leaving the parent feeling rejected and insecure. For a child to develop a secure attachment, they need to have faith in their parent that they will be there for them when they cry, feed them and keep them safe (Bowlby 1969) but a narcissistic parent lacks empathy (the ability to read other people’s emotions) and so would not be able to respond naturally and instinctively to a baby’s needs. This can lead to anger from both child and parent as they are “out of sync” and can cause long term damage to the attachment as they become detached from one another and eventually avoidant (Ainsworth 1970). Added to that, a narcissist has an idealised view of love and has to be centre of attention. A baby can take the other parent’s attention away from the narcissist which destroys their sense of importance. They quickly become jealous of the child and “punish” both parent and child by withdrawing even further and reinforcing the avoidant attachment. As the child grows up and may begin displaying some talents which the narcissistic parent feels they can use, the narcissist may try to get involved again. The child, who has always craved the attention of the narcissistic parent, relishes this new interest and will “perform” as requested to ensure they remain involved (conditioning). But as discussed above, the narcissist parent will prone to “push-pull” parenting and therefore the child is left feeling confused, rejected and often angry. They struggle to trust and can self loath. Thus repeating the cycle within their own adult relationships. 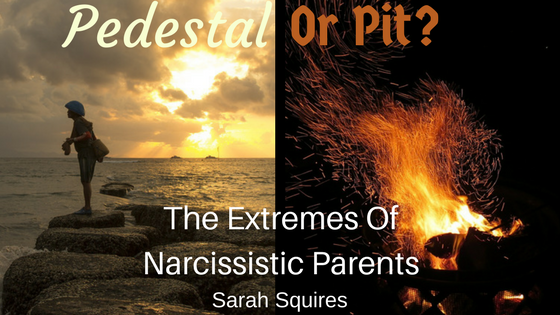 What can you do if you are a child of a narcissistic parent? The most important thing you can do is to practice self love. Work on your self esteem and change how you view yourself. According to Bowlby (1969), early attachments act as a prototype for future relationships via the internal working model. Start working on these three elements by surrounding yourself with trustworthy people, identify your value to others and society, and recognise the quality relationships which you have with those around you. Daily affirmations to confirm these beliefs can help to re programme your internal working model and therefore improve your future relationships.